"Hmm, hairy ears and a waxy buildup." On the list of 2014 Oscar nominees for Best Animated Feature, there was a perfectly wonderful film you probably hadn’t heard of. 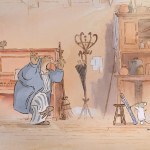 Beyond the sisters of Frozen, the minions of Despicable Me 2, and the rudest of the Croods, there was Ernest & Celestine, two unlikely French friends at the center of the sweetest and simplest of all the nominated entries. 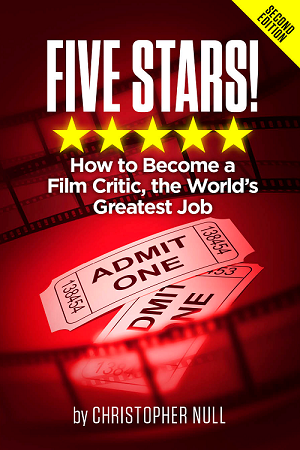 It’s a movie without a catchy chart-topping song, and completely devoid of cheap visual gags. What it offers is a smart genre story, with a lovable pair of lead characters to grab the interest of your family’s littlest mice and biggest bears. I’m getting ahead of myself. Celestine is a mouse, a cute, roundish, kind-hearted orphan who refuses to believe the conventional myth that all bears are mean mice-eaters. Ernest is a bear, a boxy, bulky loner who’s emerged from hibernation to perform on the streets and beg for coins and food. They live in adjacent environments – all bears are above ground, all mice are below – but find they have a functional need for one another, which I’ll leave vague here. 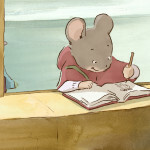 Knowing too much would ruin some of the wonder of the film, based on Gabrielle Vincent’s Ernest and Celestine books. Let’s just say plenty of cops get involved, and dentistry plays an important role. Director Benjamin Renner, who collaborated with Stéphane Aubier and Vincent Patar (the team behind the astounding A Town Called Panic), keeps his film lean and superbly structured. The opening details are revealed slowly and carefully, followed by sequences that pick up the pace until we arrive at Ernest & Celestine’s most engaging location: Ernest’s solitary winter cottage, where the pair retreat to go into hiding like a couple of crooks on the lam. Here’s where Daniel Pennac’s screenplay is at its finest, the off-balance pals forming an emotionally dependent relationship that, despite its occasionally manipulative moments (tear), is loving and unabashedly sincere. Renner’s animation style is a comfy fit for the subject matter; his clean, storybook sketches and muted colors emphasize motion and light rather than the excessive visual detail of more “commercial” animated approaches. The simplicity works well even beyond the two main characters, as a chase scene involving hundreds of scurrying police mice proves. 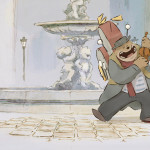 We could almost believe that Ernest & Celestine is unique enough to leave our story as is, letting a bear and a mouse live out their days away from the crowds, with no big narrative payoff other than love. Alas, traditional fable constructs come knocking at the door, bringing our heroes back to reality – but also resulting in an inspiring sequence of parallel editing with Ernest and Celestine in peril, independently pleading for tolerance, assuring their worlds that any two people who care for one another should be able to stay together. It’s the least subtle of Renner’s intentions, and also the most important. Beautiful and believable for any age, in any language.